After warming up the engine and turning it off, wait more than five minutes for the oil to drain back into the bottom of the engine. the dipstick out and check the oil level. • Used engine oil contains potentially harmful contaminants which may cause skin disorders such as inflammation or skin cancer, so care should be taken to avoid prolonged and repeated contact. To remove used engine oil from your skin, wash thoroughly with soap and water. • Dispose of used oil and filters only in a safe and acceptable manner. Do not dispose of used oil and filters in household trash, in sewers or onto the ground. Call your Toyota dealer, service station or auto parts store for information concerning recycling or disposal. • Do not leave used engine oil within the reach of children. 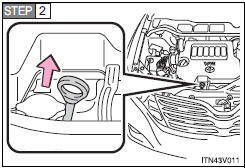 • Avoid overfilling, or the engine could be damaged. 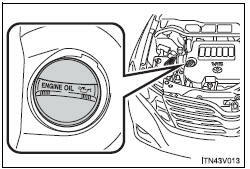 • Be sure the engine oil filler cap is properly retightened.